Fullback Kevin Turner while at Alabama would block for not only for 1000 yard back Bobby Humphrey but also Alabama great Siran Stacy. 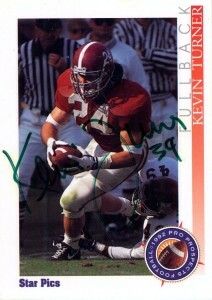 Drafted by the New England Patriots in the 3rd round of the 1992 draft, Kevin Turner was the prototypical fullback. 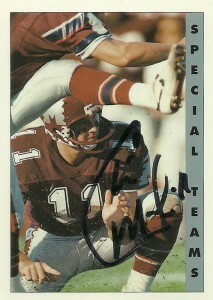 In his career in New England, Turner on occasion spurred big plays and rightfully became a fan favorite. In 1993 he lateraled a ball to teammate Leonard Russell that Russell would take 72 yards to paydirt, and later in that season Kevin rumbled 49 yards to set up the winning score versus the Browns. In 1994, Kevin caught the game winning pass in overtime against the Minnesota Vikings which spurred the Patriots on a 7 game winning streak to make the playoffs. 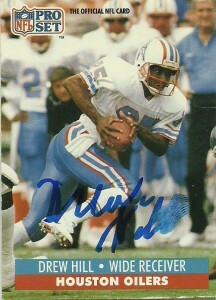 He’d play for the Patriots for 3 seasons before joining the Philadelphia Eagles as a restricted free agent. 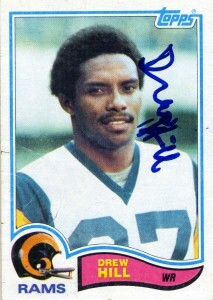 Turner became a fan favorite for the Eagles as well- due in part to his blue collar attitude and efficiency. 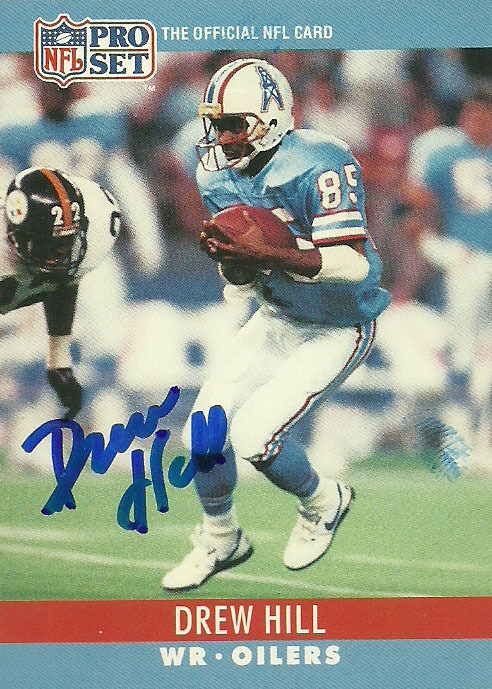 A hard nosed blocker and occasional receiver out of the backfield he’d play with the Eagles an additional 5 seasons before retiring after his 8th season due to cervical stenosis (narrowing of the spinal column,) and the crippling injuries he had suffered earlier in his career. Since his retirement, Turner has had multiple surgeries to remove parts of his spinal column, and tragically in 2010 Turner was diagnosed with Lou Gehrig’s disease which is rumored to be linked to concussions. The NFL has attempted to take a more assertive approach to concussions but still lags behind in its treatment and veteran assistance. UPDATE 3/24/16: Kevin passed away today in hospice care, surrounded and loved by his family and friends. 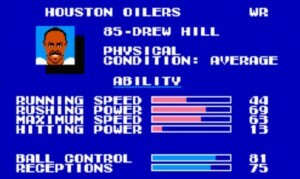 The cause of his death was Lou Gehrig’s Disease. 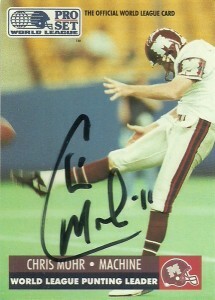 Chris Mohr was born in tiny Thompson, GA, ironically the same town of former punter great Ray Guy. In college, Mohr would attend Alabama where he ranks as one of the best punters in the school’s history. 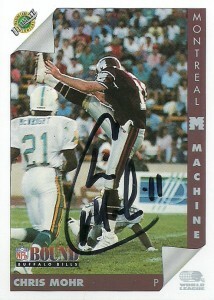 After being drafted in the 6th round by the Buccaneers Mohr would be their punter/holder for 1989. 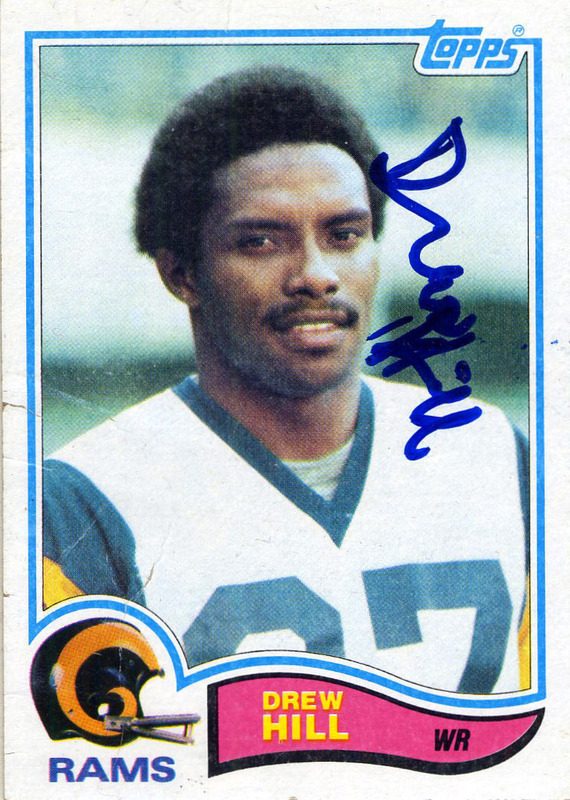 He was named to the All Rookie team that year. 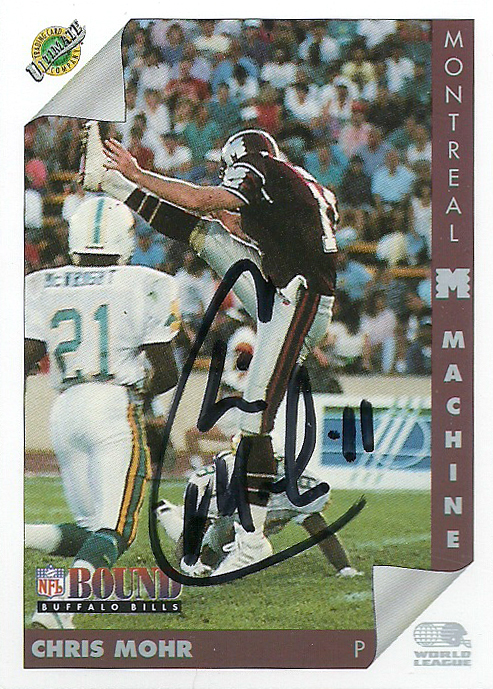 After being disappointedly cut in 1990, Mohr was drafted by the Montreal Machine of the WLAF, in their inaugural positional draft. Chris would become one of the Machine’s most notable players and he would capitalize off of the opportunity given to him by the WLAF to lead the league with 2436 yards on 57 punts (being named All-World in 1991.) 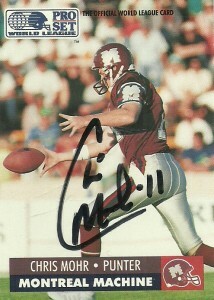 Chris was signed at the end of the season by the Buffalo Bills in 1991. 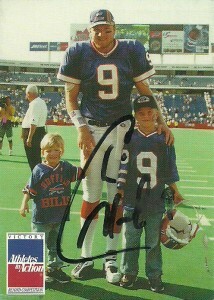 Mohr would stay with the Bills throughout the remainder of the 90s and 2000. 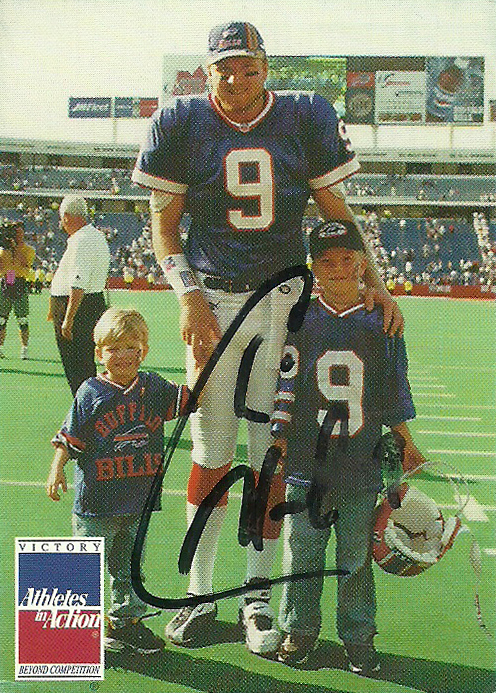 He’d play from 2001- 2005 with the Falcons, and officially announced his retirement in 2007 after signing a one day contract with the Bills. (Although many former WLAF players now pepper the coaching and minor league ranks, Chris would be the last of the original WLAF players to retire from professional football.) Since retiring Chris has been active in Fellowship of Christian Athletes, and is an accomplished country songwriter. 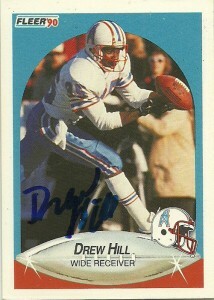 I was able to track him down with the power of Google, and he signed my 4 cards, including one of his own, in about 3 months time. Included are his WLAF statistics.